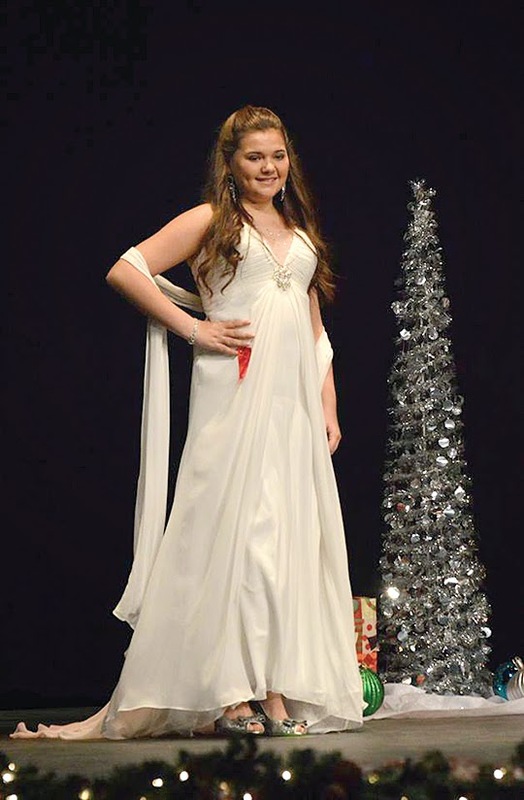 Madelyn Demmons, 11, competed for the second year in a row in the annual Maine Christmas Angel Pageant. The pageant took place at Hampden Academy in Hampden in December. Madelyn competed in beauty and outfit of choice. 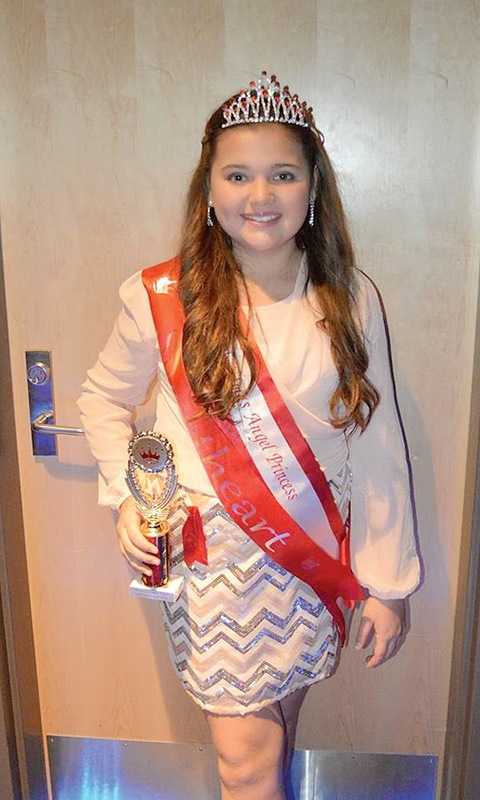 She was crowned first princess, second in her age division, most photogenic and Miss Sweetheart. A requirement to compete in the Maine Christmas Angel Pageant is for kids to collect non-perishable food items and new unwrapped toys. All donations benefit the Good Shepherd Food Bank, Manna Ministries as well as local agencies. 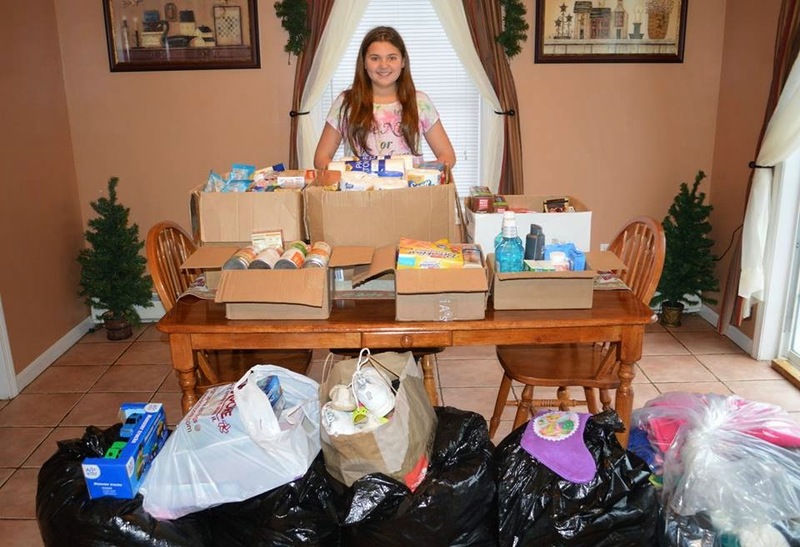 Madelyn went above and beyond her duties this year, collecting 300 food items, several new toys, and 298 clothing items (including many new jackets and warm clothing items), and all of her donations were given to the Windham Food Pantry. Another project that is dear to Madelyn's heart is sending Christmas cards to soldiers, both wounded and deployed. She started doing this when her brother was deployed overseas during the holiday season in 2009. She didn't want anyone to be forgotten at Christmas and she has made it her mission to make sure that no one is! With help from her dance team, DM Dance and her classmates at Windham Middle School, we were able to send 120 cards to our nation’s service men and women. 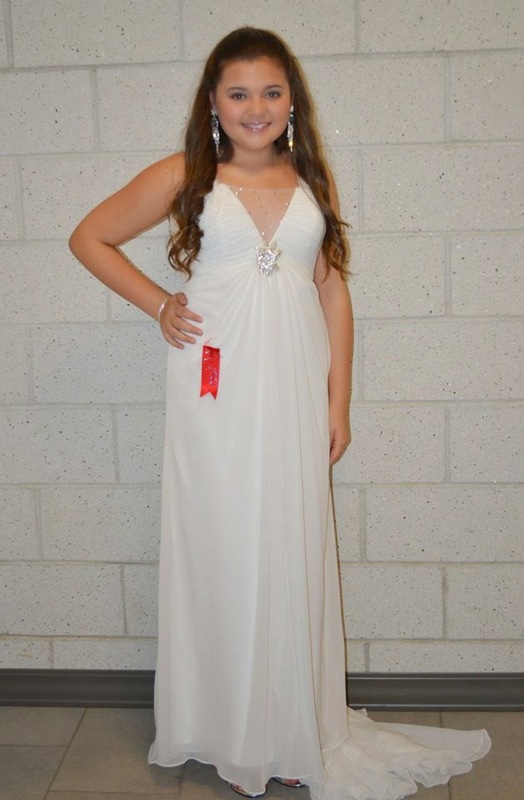 This pageant is about more than just dressing up pretty. It's about remembering the true meaning of Christmas, something which is easy to forget during a busy time of year. AUGUSTA - Rep. Matt Pouliot of Augusta announces that help is available for Maine students and families seeking financial aid for higher education. “If your child is planning to attend college, trade or technical school in the fall, January is when families should get serious about financial aid applications. For most families, financial aid has a significant impact on the college the student ultimately attends,” Rep. Pouliot said. To help parents navigate the financial aid process, the Finance Authority of Maine (FAME) will hold 29 In-Person Free Application for Federal Student Aid (FAFSA) Help Sessions around the state and has ongoing support online at FAMEmaine.com/FAFSA. This is the 11th year FAME has made these In-Person FAFSA Help Sessions available to Mainers. Over the years FAME has assisted more than 6,000 families through these events. Tip 1: Just do it! Fill out the FAFSA! The Free Application for Federal Student Aid (FAFSA) is the federal application that all schools use to determine student eligibility for federal financial aid. Many states (including Maine) and schools also use the FAFSA to distribute their own need-based financial aid. Tip 2: The “early bird” sometimes gets the worm. Fill out the FAFSA as early as possible. The FAFSA for the 2015-2016 school year became available January 1, 2015 and can be found at www.fafsa.gov. Many types of financial aid are only awarded to students who meet the specified deadline (each state and school has their own deadline), and some schools award aid on a first-come first-served basis. Don’t wait until your taxes are done to file the FAFSA – estimate the information and update it later! List of schools your child is considering. Online Support: If families can’t attend an in-person help session, they can visit FAME for FASFA online help. There, they can download an information checklist and watch a video that offers tips on how to fill out the FAFSA form at FAMEmaine.com/FAFSA. Families can also call 1-800-228-3734 with questions. Ask if the school(s) has any additional applications required to apply for the school’s financial aid. If income was estimated, update information on the FAFSA after taxes have been filed, ideally by using the IRS Data Retrieval Tool. Provide the school with any other required documentation or forms. Compare awards from each school by focusing on the “net price” – the cost minus grants and scholarships (funds that don’t have to be repaid). Before borrowing any loans, understand the difference between federal and private student loans. Search for scholarships and continue to do so throughout the year. Speaking of scholarships, FAME is offering three $1,000 scholarships for participants that complete the FAFSA at the in-person help sessions or through FAME’s online support program. Winners will be randomly selected at the beginning of May 2015. Hard to believe that it has already been six months since I left my full-time job to pursue my goals and aspirations as an entrepreneur and keynote speaker. A lot has happened these past months and I have learned a ton. Below are a few of the biggest lessons I have learned in my first six months as an entrepreneur. An empty calendar will fill itself, but not with things that matter. My first three months of self-employedness were pretty epic. The phone would ring, it would be my buddy Mike, Kevin, or Dean - they want to golf, boat or lunch. I would look at my calendar see that the afternoon was open and soon was on my way to enjoying a beautiful summer day in Maine. It felt great. Many times I would think I can't believe being self-employed is this...easy. Things that were meant to get done that day could easily be moved to the next day and heck, I had no boss so what's the rush anyhow? In many cases there were no major losses because of my 4.5 hour work day but, after a couple weeks of messing around I would find myself in crunch time at the end of the month when I was looking at my goals compared to my progress. What I learned was that I need to schedule my day in detail. One evening while having dinner with Internet master Ross Lasley and his beautiful family, he shared with me how he does it. Ross schedules his entire day out, in detail - literally, hour-by-hour. He told me it helps him keep on track. I figured if someone as successful and intelligent as Ross schedules his day with discipline, I probably should too. I still can't schedule my day by hour but what I do instead is make a very easy to use To Do list using "Remember the Milk." a great ios application and browser plug-in. It helps me make a really easy to follow To Do list and syncs easily with my phone. The next lesson I have learned during the past six months is, don't listen to every one. Now, I am not advocating you be a prick. I am simply saying that you started your business because you have an expertise in a certain area (hopefully). There are times when you are talking with people who do not have an expertise in your area that will tell you what you need to do next. These people mean well, but many times don't have a clue. Listen to their opinion, remember it's an opinion, and let it marinate. Trust your gut and realize that you will make mistakes but sometimes you need to in order to grow. While we are on the subject of opinions, I highly suggest you hire a good bookkeeper, lawyer and accountant. There are many, many things that I am terrible at that involve numbers. Because of this I knew without a doubt I needed to hire a bookkeeper and an accountant. They do not work for me full-time, but they are there when I need them. They help me navigate tough situations and make decisions that make long-term sense for my business. I had many people tell me, "Just do that stuff yourself and save the cash." Those people were right...doing it myself would have saved me the immediate cash but cost me the aggravation of doing it myself. Other things I have found useful to hire someone else to do for me include: Cleaning my home, sending cards, organizing contact information of important people I meet, researching potential leads, reminding me to do certain tasks, and handling all my website updates. I'm an entrepreneur now - why waste my time doing things that have nothing to do with providing for my family and/or reaching my goals? Another valuable line item I have found valuable to schedule into my day is an hour of "letting the wind blow" as my Dad would say. The saying comes from a walk my Dad and I took about five months ago. I thought it would be therapeutic for my Dad and I to meet at Spring Point and walk out to the lighthouse. As we walked I began telling him all about my life and how amazing it was to be pursuing my dreams as an entrepreneur. After about 10 minutes of this my Dad stopped at a nearby bench, sat down, and said, "Let's just sit and let the wind blow for a little while." To me it was a lesson learned - shut up every once in a while and just let life be. As an entrepreneur, I have also found it very important to travel to cities larger than where I live. It is really easy to compare yourself to your peers and feel pretty good about your growth rate if you don't continue to stretch yourself. I visit New York City every three months. In the past six months I have traveled to: Orlando, New York City, Phoenix and Boston. Being someplace larger than where I live helps challenge my thinking and makes me set larger goals. Become a voracious reader, listener, thinker and doer. I have had the good fortune of interviewing and hanging out with some incredible people. Do you want to know the one thing they all have in common? They all read about ways to improve their business and themselves. Seeing that one common trait was enough to convince me to start reading immediately. I also listen to a handful of podcasts having to do with my industry or just stuff that inspires me. A few of my favorite podcasts include: StartUp, Daily Boost, Dan Millers' 48 Days to the Work You Love and Tech411. The final lesson I would like to share about my first six months as an entrepreneur is the realization that life is pretty stinkin' great when you run the show. There is no greater feeling than knowing that if I want a raise this month then all I need to do is work harder and pitch more clients. If we do a good job those clients will refer us to more potential clients and the beat rolls on. Poem by Bob Beane - "Woodstoves, Whoopie Pies and the Solstice"
To be everywhere, at the same time. And in doing so perhaps, forgetting the original purpose of the day. We occasionally stop, to remember other things that are peaceful to us. We welcome that radiating heat from the woodstoves. The crackling sounds from the fire within it that are so deeply soothing. The ticking sounds of the iron and steel as it comes up to temperature. The room slowly filling with the warmed up air. To sit in front of the fire with our morning coffee. Those requests from long distance friends. Can you send me some of your Red Velvet Whoopie Pies? Bringing with it those associated smells and wonderful aromas. Quickly boxing them up, followed by that trip to the UPS store. The worry about whether they will make it alright. They arrived fine and are already being shared and eaten with great relish. Who lived many thousands of years ago. For those of us in this Northern Hemisphere. That silent marker that sets the seasons between Fall and Winter. Hopefully, wishfully in our lifetime. A welcoming to Father Sun as he begins his journey northward again.